Striped mullet are found along the southern Atlantic Ocean and the Gulf of Mexico. Striped mullet roe is valuable and sold on the seafood market, whereas the meat is used mostly as bait. The majority of the roe is exported to Asia. The fishery has been in operation since the 1960’s. In 2014, 10.5 million pounds were landed. 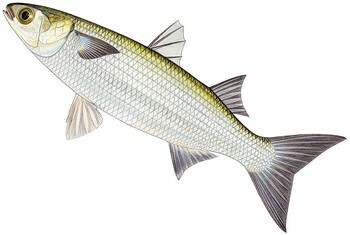 Striped mullet is exported from the US to Haiti, Colombia, China, Taiwan and the Dominican Republic. Management is conducted by state. In the Gulf of Mexico, the Gulf States Marine Fisheries Commission (GSFMC) is responsible for the management of the striped mullet, whereas the Florida Fish and Wildlife Conservation Commission operate in Florida. Both fishery dependent and independent data are collected. Stock assessments are performed regularly, and many management measures exist to help control the fishing. Bycatch levels are low. Overall, management of this fishery is highly effective. The striped mullet population is considered to be healthy with low fishing mortality. The species is resilient to fishing pressure as it is highly fecund, short-lived, and matures at a young age. Cast nets do not make contact with the ocean floor and hence cause virtually no habitat damage. Beach seines make some contact with the ocean floor. However, they are deployed over sandy/muddy substrate, which is recovers quickly from physical disturbance. Striped mullet form dense schools during spawning, which is when they are targeted for their roe. The schooling behaviour ensures very low levels of bycatch. Some bycatch occurs during non-spawning season. Red mullet have a wide distribution from the North Sea to the Mediterranean in the Northwest Atlantic. They are typically found along muddy and rocky ground and feed on benthic invertebrates and fish. Although trawls are the main commercial gear to target this species, smaller fisheries such as the one in Cornwall, UK, have developed using bottom gillnets. There is some concern on the impact of gillnet bycatch on other demersal species such as cod, pollock, horse mackerel, and dogfish as well as marine mammals. The trawl fishery poses similar concerns. In addition gillnets, beam trawls, and bottom trawls all have the potential of posing significant habitat damage. Currently, there are no imports of UK mullet into the US/Canada.